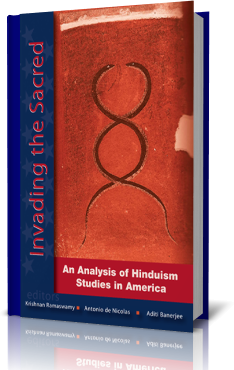 Invading the sacred: An analysis of Hinduism Studies in America, edited by Krishnan Ramaswamy, Antonio de Nicolas, Aditi Banerjee, Rupa & Co. New Delhi, India. 2007. Like the multiplicity of the authors who have contributed to this volume, many factors have converged to create this book. These include a growing dissatisfaction with Western images of the non-West, the application of inappropriate methodology for understanding traditional worldviews, and the continued hegemony of the West even in matters that don’t concern it, such as what Hindus think about their puranas. Already in the first decades of the twentieth century, many Indian thinkers declared that Indic culture cannot be subjected to, much less analyzed through the blurred lens of Western rationality. Indeed it may be said more generally that scientific probing and cold rationality can never grasp the full significance of any living tradition.